Join us in our commitment to turn childhood dreams into reality by supporting THONTM. Together, Madeline Woody and Ashley Gutierrez, are taking action by uniting with 16,500 student volunteers and over 25,000 alumni supporters in the fight against childhood cancer. Our year-long efforts culminate in a 46-hour, no-sitting, no-sleeping dance marathon each February to celebrate our survivors, remember those we’ve lost, and take a stand--all in hopes of one day dancing in celebration of a cure. Madeline Woody and Ashley Gutierrez have been working tirelessly all year with the hopes of being selected to dance in THON 2019. Independent Dancer Couples are dedicated individuals who set up their own fundraisers throughout the year, and with the support of friends and family, will obtain tickets in a lottery system in the hopes of earning a spot as dancers in the Penn State Dance Marathon. With your contribution, you will bring Madeline Woody and Ashley Gutierrez one step closer to being able to take a stand against childhood cancer during THON Weekend 2019. 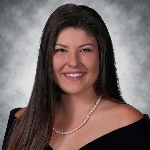 Madeline is a senior majoring in Industrial Engineering. 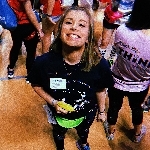 She has spent her first three years at Penn State raising money for THON through both her sorority, Alpha Chi Omega, and Club Ski Benefitting THON. Last year she had the opportunity to be a THON chair for both organizations. She served as the Corporate Sponsor Chair for Alpha Chi Omega, and the Alternative Fundraising Officer for Club Ski. Through her efforts she was able to lead these organizations to raise the most amount of money possible. This year she hopes to take what she has learned from these positions and raise more money than ever with her IDC partner, Ashley Gutierrez. She also plans to donate her hair this year at THON 2019. 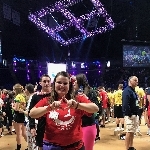 Her favorite THON memory came to be during her very first THON. In 2016, the final 4 hours were about to start and she had already spent 38 hours at THON. After watching the videos played on the jumbotron, she found herself brought to tears. Looking around she felt connected to everyone in the BJC. But it wasn't until she received a hug from Club Ski's THON child's father, that she truly felt the impact of THON. He was hugging everyone in the club, and when he walked up to Madeline, he pulled her into the warmest embrace and said, "Thank you so much for all that you do for me and my family. Without you, our son might not be here today. So thank you for everything and keep doing what you're doing." Those words have stuck with her and are what drive her to raise money and awareness for what we do here at Penn State. She hopes that one day no parent ever has to hear the words your child has cancer again. Ashley is a senior double majoring in Psychology and Criminology. She has spent her first three years at Penn State raising money through her sorority, Alpha Chi Omega, as well as being directly involved with setting up and tearing down THON weekend decorations with her OPPerations committee. This year, she hopes to take what she has learned from these positions and not only raise money for the kids with her IDC partner Madeline Woody, but also dance in the fight for a cure. 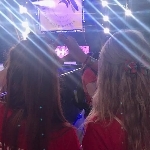 Her favorite THON memory came to be during 2018. It was the final 4 hours, and she was standing with her committee, ready to give up from the tiresome weekend. Then the faces of all the children played on the jumbotron, and with tears in her eyes, holding the hands of her committee members, she realized in that moment why she was there - for the kids. The faces of our THON children are what drive her to raise money and awareness for what we do here at Penn State. She hopes that one day no family has to ever watch their child fight this terrible disease. She fights for a cure.